As the Australian Derby closes in, with the race taking place at Randwick Racecourse in Sydney on Saturday, the bets for the race have been coming in and the trend seems to be pointing in one direction and one outcome: It’s A Dundeel. At 1/4, It’s A Dundeel is set to start at the shortest ever odds in the history of the Australian Derby, odds that were complemented after the colt was drawn in a favourable gate eight. Leading the charge against the seemingly inevitable over the 2,400 meters are Philippi and Hippopus, but you feel that it will either take a mistake or an extraordinary performance to overcome the race favourite. 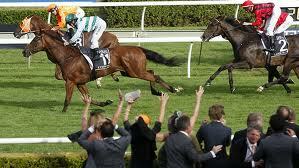 The best place to have a bet on the 2013 Australian Derby is with Bet365.com. The odds below were taken from the site, and you will be able to find the latest race odds there as well. The Australian Derby is considered the top ranked event for three year olds in Australia and New Zealand, and consequently a strong field has been assembled for the race, despite there being a clear favourite according to the bookies. Indeed, It’s A Dundeel has been the delight of horse racing writers this last week, as many believe that the Australian Derby is just that: a done deal. The three year old Triple Crown chasing colt, after having won the Randwick Guineas as well as the Rosehill Guineas, deserves to be favourite on that basis alone. But few would argue against the horse’s credentials. With regard to his own horses, who have been installed as fairly long odds for the Derby, Hayes has not ruled out an upset, though he acknowledged the difficulties they would face. The Australian Derby is one of the few major races that Hayes is yet to win, but if anyone can build a winner, it’s Hayes. Trainer Mick Kent, during his preparation for Philippi, who comes into the race at 13/2, also had his say on the overwhelming race favourite, stating that he couldn’t find any apparent weaknesses in him, adding that he may actually be better suited for the 2,400 meters race distance in schedule for Saturday. Getting back to his own horse, Kent said he was pleased with the way Philippi had won the 2000 meters Tulloch Stakes at Rosehill. As mentioned above, the best racebook to place a bet on the 2013 Australian Derby is Bet365.com, who will offer the best odds on the race. When visiting Bet365.com, click on ‘Horse Racing’ in the left sidebar and scroll down to the Antepost section of the page, where you will find the markets for this race and many more. The Australian Derby is a Group 1 turf race run at Randwick Racecourse in early April. The 2,400 meters is open to three year olds and has a projected purse of approximately AUD 1,500,000.